The short version first . . . There are firsts about which we all have some knowledge, hopefully. One that might not be in your immediate recall list is the first American to orbit the Earth. In elementary school, I learned about things like this during “Show and Tell” or “Week in Review.” Regardless, if you are into the aerospace scene, as I usually am, the first American to orbit the Earth passed away this week. That intrepid aviator was none other than John Herschel Glenn, Jr. Most of us in the 1960s and interested in the relatively new National Aeronautics and Space Administration (NASA) knew his name well as one of the premier members of the Project Mercury Seven, the astronauts chosen to make the first ventures into the realms of outer space, starting just a bit over 100 miles above surface of our “pale blue dot” (the late Dr. Carl Sagan). John Glenn was, in fact, probably one of the most intrepid airmen of them all. Mr. Glenn, at the age of 95, passed away this week (December 8, 2016). 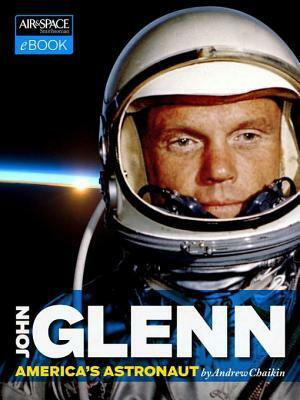 In a publication by the Smithsonian Institute,Andrew Chaikin provided a brief (70 page), enhanced (with several photographs and 2 videos) biography, entitledJohn Glenn: America’s Astronaut , a truly outstanding American, a Marine aviator and test pilot, a veteran of World War II, the Korean Conflict, Project Bullet, and the first American 7, Mercury Atlas Astronauts. He was married to Annie Castor in April, 1942. They had two children, John David, and Lyn. Annie and the children survive their husband and father. In this biography,Mr. Chaikin looked at Glenn’s life from New Concord, Ohio, through private flying after college and later Marine training, seeing combat in World War II in the Pacific Theater and in the Korean Conflict, to test pilot training at Patuxent River, MD where he participated in Project Bullet, a program designed to find out who could fly the fastest over a pre-determined non-stop transcontinental route. Glenn did so breaking the record by 23 minutes and 74 miles per hour faster than the previous record.Mr. Chaikin provides detailed treatment of Major Glenn’s early experience with the National Advisory Committee for Aeronautics (NACA) which focused on piloted space vehicles where test pilots were needed. Glenn requested assignment to participate in the study, and he was accepted. He also was in position to move to the re-designation of the NACA to the National Aeronautics and Space Administration (NASA). He competed for and was accepted to the first classes of seven astronauts to pilot space craft in NASA’s Project Mercury. Included in this section of the book is a video mashup of original 16mm film footage from the camera in Glenn’s spacecraft while making its maneuvers to leave orbit and land safely in the Atlantic Ocean.Mr. Chaikin worked with the project by adding an audio blend of original taped conversations between Glenn and the group during the entire process. Detail was exceptional, and even a person with skill at doing these types of mashups would be pleasantly astounded at the quality of result. The book also contains a similar type of video presentation based on Glenn’s last space flight about Shuttle Discovery where he became the oldest human to ever fly in space, as the 7th member of the STS-95 crew. His narration of the images projected on the screen is humorous and factual, and it is presented in the same, smiling voice that characterized Glenn all through his life. The last sentence of the book is a fitting tribute to Mr. Glenn as a summation of his exploits and deeds, coming from Steve Robinson, another member of the STS-95 flight crew who said of Glenn, “I ended up thinking the John Glenn isn’t a great person because of what he accomplished in life, it’s the other way around. He’s accomplished these amazing things in life because he’s a great human being.” Would that we could all share that accomplishment in our own lives!Recommendations:This is a 5 out of 5 star read, certainly. It is short by some benchmarks, but as a synopsis of a full life, it hits the mark. Even a slow reader like me was able to navigate the book including the videos (which I really enjoyed) in an easy half-day, and believe me, that is a fast read for me. The topic is fit for all readers of any age where the only drawback to ages able to read might be the vocabulary. The book is certainly worthy of being included in any school’s library from mid-elementary through high school. Even (and especially) adults will find many things to appreciate about the writer and his subject. It is an elegant, simple read about a true American icon. Scott Carpenter, one of the Mercury seven said, “Godspeed. John Glenn,” as Glenn lifted off on the Friendship 7 mission in Project Mercury. A more fitting sendoff, there never was, is, or ever shall be. May Godspeed us all on every journey we attempt no matter how long or how far.Review of Andrew Chaikin's John Glenn: America's Astronaut by Richard Buro is licensed under a Creative Commons Attribution-ShareAlike 4.0 International License.Based on a work at https://www.goodreads.com/book/show/22439964-john-glenn.Permissions beyond the scope of this license may be available at http://www.penguin.com/subrights/. The disclaimer of all disclaimers, short of being the author: My magazine, Air & Space, commissioned and published this e-book. (Though I didn't work on it personally. )Andy Chaikin is an extremely talented space historian, and he shows it off here. This is a both a fairly comprehensive look at John Glenn's life--from his childhood to his retirement (this was published 2 years before his death)--and yet is a quick read at only 80 pages. If you'd like just a bit more glimpse into the life of this impressive aviator, astronaut, and generally kind and descent human being, definitely pick this up. The Kindle also includes lots of photos, which appeared fine on my old school b&w device, and 2-3 videos, which did not work on mine but should display properly on a Kindle Fire. Andrew Chaikin - Award-winning science journalist and space historian Andrew Chaikin has authored books and articles about space exploration and astronomy for more than 25 years. Writer-director and explorer James Cameron (Titanic, Aliens of the Deep) called him “our best historian of the space age.” Chaikin is best known as the author of A Man on the Moon: The Voyages of the Apollo Astronauts, widely regarded as the definitive account of the moon missions. First published in 1994, this acclaimed work was the main basis for Tom Hanks' 12-part HBO miniseries, From the Earth to the Moon, which won the Emmy for best miniseries in 1998. Chaikin spent eight years writing and researching A Man on the Moon, including over 150 hours of personal interviews with 23 of the 24 lunar astronauts (Apollo 13's Jack Swigert was already deceased). Apollo moonwalker Gene Cernan said of the book, "I've been there. Chaikin took me back." A new edition of the book, with a new afterword for the 50th anniversary of the space age, was published by Penguin in 2007. Chaikin’s newest book is A Passion for Mars, published in September 2008 by Abrams. Apollo 11 astronaut and author Michael Collins called it a “masterpiece of a book,” and Rocket Boys author Homer Hickam said, “I am completely and utterly in love with this book.”Upcoming works to be published in May 2009 are Voices from the Moon (Viking Studio) featuring excerpts from his conversations with Apollo astronauts, and Mission Control, This is Apollo (Viking Childrens) a book for middle-school readers illustrated with paintings by Apollo moonwalker Alan Bean. He is also the author of Air and Space: The National Air and Space Museum Story of Flight, published in 1997 by Bulfinch Press. Chaikin's illustrated narrative of space exploration, SPACE: A History of Space Exploration in Photographs, was published in 2002 by Carlton Books. He co-authored the text for the highly successful collection of Apollo photography, Full Moon, which was published by Knopf in 1999. Chaikin collaborated with moonwalker-turned-artist Alan Bean to write Apollo: An Eyewitness Account, published in 1998 by the Greenwich Workshop Press. He also co-edited The New Solar System, a compendium of writings by planetary scientists, now in its fourth edition. His essays include the chapter on human spaceflight in The National Geographic Encyclopedia of Space, published in 2004, and Live from the Moon: The Societal Impact of Apollo for NASA’s 2007 book The Societal Impact of Spaceflight.From 1999 to 2001 Chaikin served as Executive Editor for Space and Science at SPACE, the definitive website for all things space. He was also the editor of SPACE's print magazine, Space Illustrated.Chaikin is a commentator for National Public Radio's Morning Edition, and has appeared on Good Morning America, Nightline, and the NPR programs Fresh Air and Talk of the Nation. He has been an advisor to NASA on space policy and public communications.A former editor of Sky & Telescope magazine, Chaikin has also been a contributing editor of Popular Science and has written for Newsweek, Air&Space/Smithsonian, World Book Encyclopedia, Scientific American, and other publications.A graduate of Brown University, Chaikin served on the Viking missions to Mars at NASA's Jet Propulsion Laboratory, and was a researcher at the Smithsonian's Center for Earth and Planetary Studies before becoming a science journalist in 1980. He is an amateur musician and songwriter; he has also been an occasional space artist, and is one of the founders of the International Association of Astronomical Artists.